The Monumental City sent an imposing team to defend its 2014 victory on Saturday, September 9th in the NBC-10 Newport International Polo Series, presented by BMW. Representing Baltimore in the #1 position was Jim Stanton. Playing #2 was George Hempt. In the #3 position was Nik Feldman, and at back, Estani Puch. Playing for Newport in the #1 position was Peter Friedman. At #2 was Minnie Keating. In the #3 position was Heather Souto, and at back was Rory Torrey. Baltimore controlled the opening of the match, making an impressive play from the lineup with the first goal drawn by Feldman. Hempt championed the next play with a decisive run to gain Baltimore’s second goal. A one-two play by setup by Torrey and finished by Freidman put Newport on the board before the chukker’s end. The two teams held fast through the second chukker as their heavy hitters, Torrey and Puch put up a goal each for a 3-2 Baltimore lead. Tight defense maintained the one goal spread with a goal by Feldman for Baltimore was matched by Souto, ending the first half 4-3 in favor of Baltimore. After a little half-time strategizing, Newport catalyzed a comeback with goals by Torrey and Keating met by a single goal from Puch to tie the match at 5-all. The fifth chukker saw a return to dominance for Baltimore as goals from Hempt and Puch put the team back in the lead, 7-5. 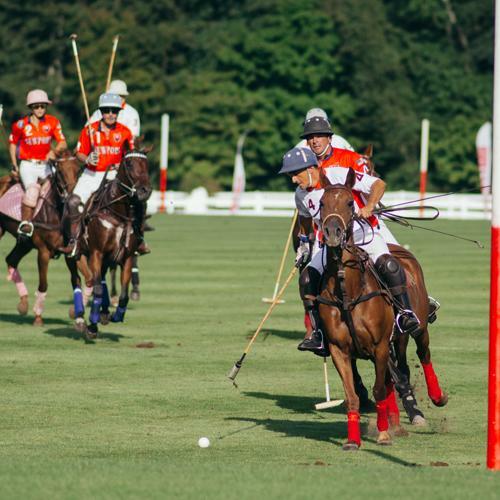 Puch continued the offensive to open the final chukker with another Baltimore goal, but Torrey matched it to keep Newport within reach of the cup. Puch racked up another goal and Hempt sealed the deal, putting Baltimore into double digits before the final bell signaled a 10-6 Baltimore victory. During the match, a lucky lady from Barrington, RI won a leather handbag from Brahmin in the weekly door prize drawing. Tailgaters were green with envy over a beautiful tailgate spread on the lawn with a mouthwatering buffet, adorned with lush greenery, and a field side butler that won the Stella Artois best tailgate picnic trunk. Following the match, the teams took to the podium for the Veuve Clicquot Champagne Toast and Trophy Presentation, where Rory Torrey (scoring 4 goals for Newport) and Estani Puch (scoring 5 goals for Baltimore) were named as top players of the match. Nell Melanson of the Clarke Cooke House presented the perpetual Liberty Bowl to the victorious Baltimore team.